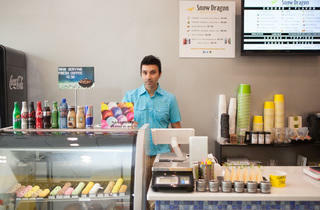 Photograph: Martha WilliamsCo-owner Roshan Meghani at Snow Dragon Shavery. 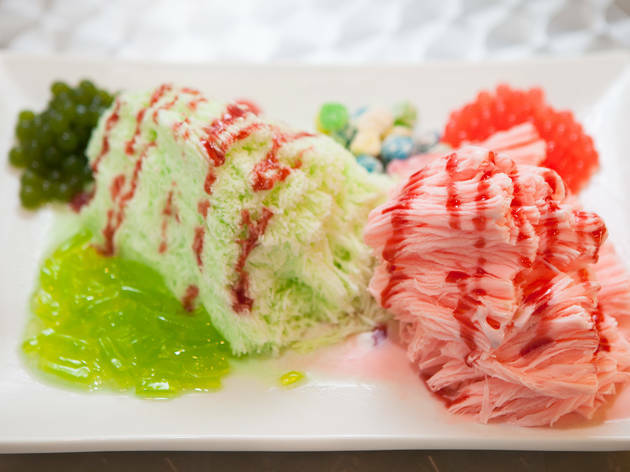 Just in time for summer comes a brand new frozen dessert spot—Snow Dragon Shavery, which serves up Taiwanese-style shaved snow. 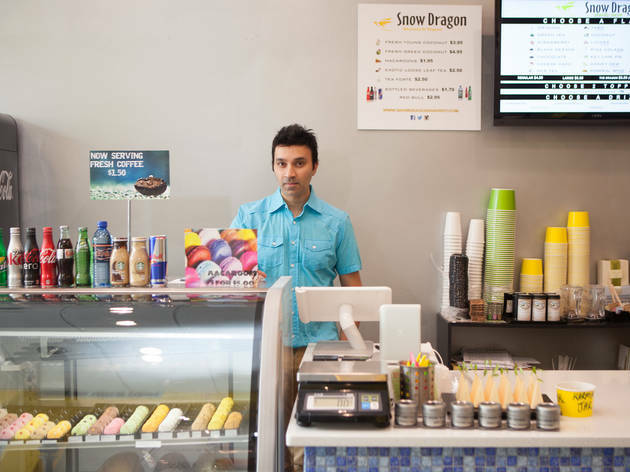 The frozen treat hasn’t been easy to find around the area (Cloud 9 used to serve it, but they closed a few years ago), but Chicagoans Gulzar Huda and Roshan Meghani opened Snow Dragon in spring 2015 with more than 10 flavors of shaved snow, including green tea, vanilla and chocolate, along with frozen yogurt, fresh coconut water and baked treats. 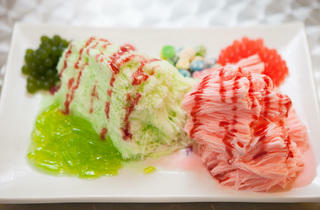 The snow is flavored, then frozen into a block, and it’s shaved onto your plate to order in front of you. 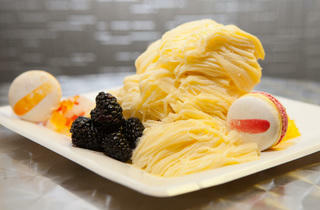 The texture is softer than shaved ice or a snow cone, but lighter than ice cream or frozen yogurt. Most flavors are dairy-based, so they're slightly creamy, and the delicate snow melts in your mouth immediately, so it’s pretty refreshing. After selecting the flavor, you can add on toppings, including fruits, jellies, boba and candy, but if you have no idea where to start, ask the server. I ordered black sesame snow, and she suggested I add lychee jelly and sweet red beans to complement the almost savory snow. I also tried the piña colada snow and added coconut flakes and strawberry juice-filled balls. 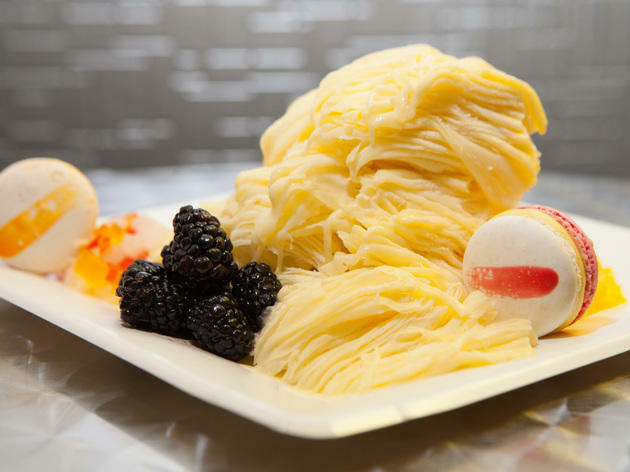 The snow is finished with a topping drizzled over it, and while sweet condensed milk is the traditional option, fruit and chocolate drizzles are also available. Snow Dragon is open late, just like Wiener's Circle next door, but it's a slightly more civilized option for a late-night snack. El stop: Red to Fullerton. Brown, Purple to Diversey. Bus: 22, 36, 151. 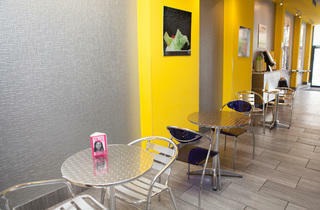 Snow Dragon Shavery is the perfect place to satisfy your sweet tooth! 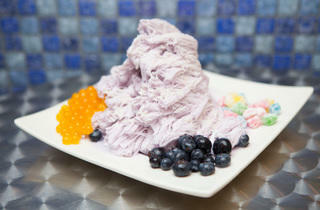 I am not much of a heavy, decadent dessert lover so the refreshingly light shaved snow was a great choice for me. The friendly manager helped me decide from a dizzying menu of deliciousness - I opted for a taro shaved snow with rose drizzle, lychee, and fruity popping pearls. 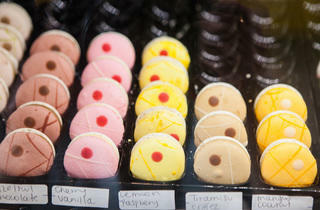 I paired mine with pistachio and rose macarons - too pretty to resist! Love this cute and lively place for a treat with friends. I admit, I'm a regular here. 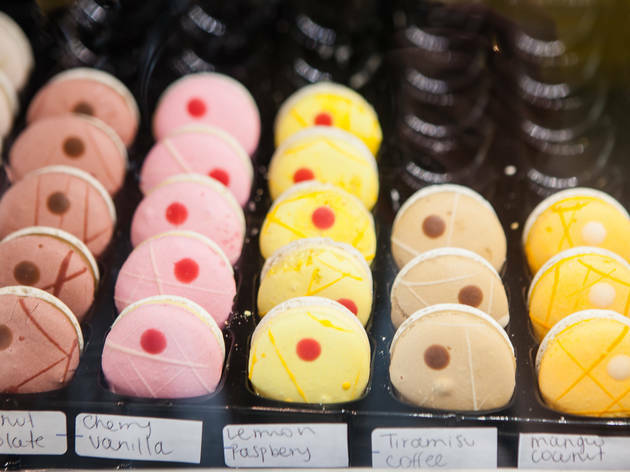 If you are looking for a unique sweet shop, Snow Dragon Shavery is hands down the place for that. Ice cream, macarons ...ice cream macaron and donut ice cream SANDWICH?! That's just brilliant! Plus they also have a variety of flavors to choose from not to mention some exotic flavors like taro, ube and halo-halo?! Come on now. The employees are super nice and friendly, and the shop itself is a cute place to hang out with fam and friends while satisfying your sweet tooth. I say go and judge it for yourself!